Ever been to a traditional cider farm in Somerset? They vary from dimly lit grubby sheds to impressive commercial operations but they all have something in common, they are all slightly quirky with an unmistakable west country charm. Our aim is to bring a small slice of this ‘quirk’ and ‘charm’ to events and people who are looking for something a bit different! Ciderpig is a 1957 Citroen HY van converted into a mobile cider bar, to our knowledge we are the only independent mobile cider bar in Somerset. We serve a selection of traditional still ciders (scrumpy), bottled ciders and some sparkling traditional method bottle fermented cider. We also serve a selection of ale, Lager, wine and spirits for non cider drinkers. If you have any specific requests for drinks we can put them on. Ciderpig is available for private events including weddings, anniversaries, birthdays, bar mitzvah’s, etc with a minimum 120 guests. 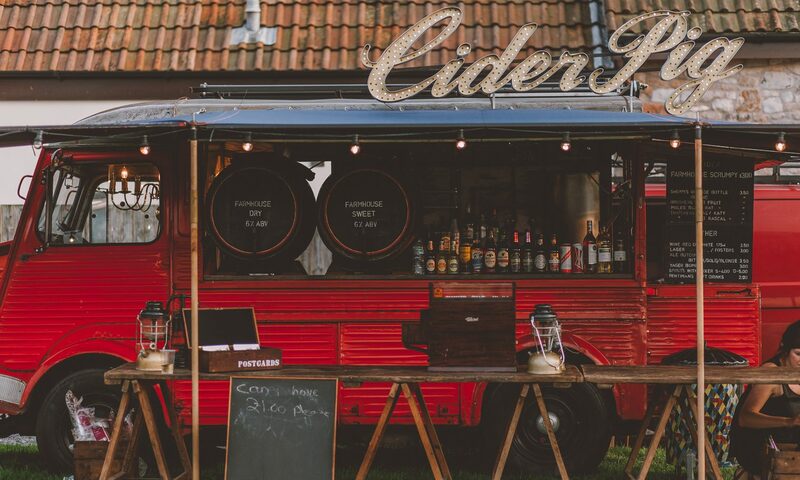 We are also available to provide a cider only bar for larger events and festivals. Dry hire and bespoke services are available to select corporate clients. We are not currently equipped for food production or catering but do have a range of snacks. If you would like a traditional pig roast to compliment the cider we will be happy to recommend someone suitable.